Alyssa Dougherty is a big advocate when it comes to global food security. Through her work as a hunger fighter, she has impacted many lives, both locally and globally. Her passion for food security stems from her experience with the World Food Prize, which she first became involved with seven years ago. In high school, she attended the Iowa Youth Institute for four years and the Global Youth Institute for one year. From there, Dougherty’s passion for global food security was born. The next stop for Dougherty was Iowa State University. As a way to help fight local hunger, she volunteers at the SHOP student food pantry, where she serves as the president. She’s also an International Friendship Connection Group Leader and is involved with the Honors Program, the Student Dietetics Association and the World Food Prize Foundation. 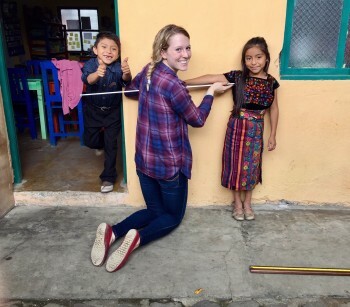 The experience that has impacted Dougherty’s advocacy for global food security the most was her time in Guatemala as a 2017 Borlaug-Ruan International Intern between her freshman and sophomore year of college. She worked in a group of seven that included people from the United States, Guatemala and the Netherlands. The group conducted a study involving soups and malnourished mothers. From the study, Dougherty and her group found that the majority of the women preferred the soup with the whey protein powder added in. The group also got to experience other aspects of Guatemalan culture. “From chatting with locals about the country’s political disruption, to getting my hands dirty on a vegetable farm and witnessing the impact of a hospital for malnourished infants, every experience opened my eyes to the ever-changing, complex world we live in,” Dougherty said. Dougherty was also a part of Land O’ Lakes’ Global Food Challenge Emerging Leaders for Food Security program, where she was able to research international issues related to food security. She also traveled to different parts of the country and the world, including South Africa, Malawi, Indiana and Minneapolis. After their experience with the Land O’ Lakes program, Dougherty and three other interns started ‘Project Do Good’. The group is working to raise money through a GoFundMe page for Leliebloem group home, which is an orphanage that the group volunteered at during their time in South Africa. The group’s goal is to raise $20,000. After seven years of being a part of the World Food Prize, Dougherty still finds ways to be involved and utilize the resources they provide. After graduating, Dougherty plans to apply for the Iowa State Dietetic Internship, become a registered dietitian and go to graduate school for a master’s degree in international nutrition. She hopes all of these accomplishments will help her reach her career goal.